Lee Hae-chan, Special Envoy of ROK President Moon Jae-in, member of the ROK National Assembly and former prime minister, will visit China from May 18 to 20. As agreed by all parties, China and the ASEAN member states will hold the 14th Senior Officials' Meeting on the Implementation of the Declaration on the Conduct of Parties in the South China Sea (DOC) on May 18 in Guiyang, Guizhou Province, which will be attended by Vice Foreign Minister Liu Zhenmin and senior officials of the foreign ministries of the ASEAN member states. The 21st Joint Working Group Meeting on Implementing the DOC will be held back to back before that. China will continue to have an in-depth exchange of views with the ASEAN member states on implementing the DOC, promoting maritime cooperation and conducting consultations on the COC. The 23rd China-ASEAN Senior Officials' Consultation will be held on May 19 in Guiyang, Guizhou Province. Vice Foreign Minister Liu Zhenmin will co-host the meeting with Chee Wee Kiong, Permanent Secretary for Foreign Affairs of Singapore, the coordinator of China-ASEAN relations. Senior officials from ten ASEAN member states and the representative of the Secretary-General of the ASEAN will attend the meeting upon invitation. The meeting will focus on the development of China-ASEAN relations and regional cooperation of East Asia and lay a groundwork for such high-level meetings within this year as China-ASEAN Leaders' Meeting and Foreign Ministers' Meeting. On May 19, the 1st meeting of China-Philippines bilateral consultation mechanism on the South China Sea issue will be held in Guiyang. Vice Foreign Minister Liu Zhenmin and Philippine Ambassador to China Romana will lead delegations to the meeting. The two sides will have friendly dialogues and consultations on the South China Sea-related issues. Q: Now the curtain for the two-day Belt and Road Forum for International Cooperation has closed. How does China evaluate the outcomes of the Forum? A: Last evening, the Belt and Road Forum for International Cooperation drew its curtain in Yanqi Lake International Convention Center in Beijing, marking a successful end to a grand international event. As a high-level gathering for the Belt and Road initiative participated by countries around the world, it has won acclaim from all attendees and the international community. Everyone believes that this Forum, by reviewing the outcomes achieved by the Belt and Road cooperation and pooling together consensus, has pointed out the direction, charted the course, clarified action plan for the Belt and Road International Cooperation. It is a successful, glamorous, and pragmatic meeting with fruitful achievements. This Forum sent forth a strong signal that calls on all parties to forge cooperation platforms, seek momentum for world economic growth, and prop up confidence for the development of the economic globalization. We believe that this Forum will have profound and far-reaching historic influence. I want to add that the Leaders Roundtable attended by President Xi Jinping and 29 other world leaders adopted the Joint Communique. As an important political document of the BRF, the Joint Communique was reached after multiple rounds of consultations by all parties through an open, fair and transparent process. The Joint Communique, with five parts covering general context, cooperation objectives, cooperation principles, cooperation measures, and vision for the future, maps out the direction and highlights of the future Belt and Road cooperation and beams out a clear and powerful light for promoting international cooperation and building an open world economy. As the first comprehensive, systematic, authoritative and multilateral document under the Belt and Road frame, the Joint Communique fully reflects the cooperation consensus of all parties and the important outcomes of this Forum. Q: First, the Indian government previously said that it would not take part in the BRF and accused China of neglecting its territorial sovereignty. What is your response? Second, it is reported that some European countries refused to sign up to a trade document. Can you confirm? Is it the Joint Communique that is in question here? A: In your first question, I believe you were asking about the statement made by the Spokesperson of the Indian Ministry of External Affairs during the weekend. I want to say that four years on after the Belt and Road was proposed, over 100 countries around the world and international organizations have supported and got involved in this initiative. Important resolutions passed by the UN General Assembly and Security Council contain reference to it. In the speech made by President Xi Jinping at the opening ceremony of the BRF which I believe was followed closely by all of you, he talked sufficiently on the four-year progress and achievements of the initiative in terms of policy, infrastructure, trade, financial and people-to-people connectivity. All these show that the Belt and Road Initiative responds to the trend of the times, conforms to the law of development, meets the people's interests and surely has broad prospects, as testified by the warm response from the international community, especially all attendees of the Forum. President Xi Jinping also said that we should build the Belt and Road into a road for peace. All countries should respect each other's sovereignty, dignity and territorial integrity, each other's development paths and social systems, and each other's cores interests and major concerns. Regarding the issue of Kashmir which the Indian side is concerned about, we have been stressing that the Belt and Road is a cooperation initiative for the common development and prosperity of the region. The China-Pakistan Economic Corridor, as an important part of the Belt and Road, is not directed at any third parties, not relevant to disputes over territorial sovereignty and does not affect China's position on the Kashmir issue. We keep saying that the Belt and Road is an open and inclusive initiative. We welcome participation from all countries to share the development opportunities. With regard to your second question, I think you are referring to the report by AFP which has nothing to do with the Joint Communique, because it was adopted as an important outcome when the BRF was concluded yesterday afternoon after multiple rounds of consultations by all parties through an open, fair and transparent process. The relevant report is about 6 thematic sessions with cooperation initiatives on specific areas. The thematic session on trade connectivity announced the cooperation initiative for enhancing trade connectivity which we have learnt is meant for declaration and open for all parties to join voluntarily. After thorough communication and extensive consultation, this initiative received positive response and wide support from various countries and international organizations. I would refer you to the competent department hosting this specific session for more details. Q: It is reported that Philippine President Duterte said when meeting with President Xi Jinping on the sidelines of the BRF that the South China Sea issue will be properly resolved through peaceful dialogues. What is your comment? A: Yesterday afternoon, President Xi Jinping met with Philippine President Duterte who was here for the BRF. The press release has already been published. The two leaders once again reached important consensus on properly resolving the South China Sea issue through dialogue and consultation, which serves the fundamental interests of China, the Philippines and people in the region as well as peace and stability of the South China Sea and beyond. China commends President Duterte for his commitment to conducting dialogue and cooperation with China on the South China Sea issue and jointly preserving peace and stability in the South China Sea. This week, the two countries will hold the first meeting of the bilateral consultation mechanism on the South China Sea issue in Guiyang. China would like to work with the Philippines to implement the relevant consensus reached between the two leaders, and maintain the long-term development of bilateral relations as well as peace and stability in the South China Sea, which is also in line with the responsibilities that must be shouldered by China and the Philippines as regional countries. 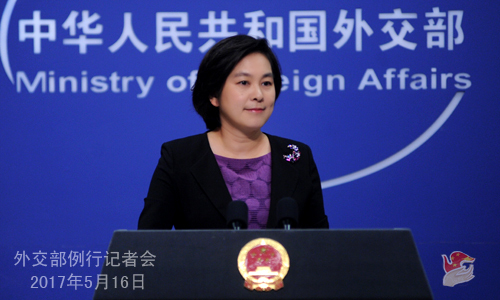 Q: What is China's expectation for the visit of the Special Envoy of the ROK President? A: Special Envoy Lee Hae-chan is tasked to visit China soon after President Moon Jae-in took office. That testifies to the importance attached by the new ROK government to its relationship with China. The China-ROK relationship is at a crucial stage at this point. We hope that the Special Envoy's visit will help the two sides enhance political mutual trust, properly settle disputes, and play a positive role in improving and developing the China-ROK relationship. Q: Last Sunday, Indonesian President Joko visited China's Niujie Mosque. He thanked China for care of Indonesian Muslims in China. What is your response? A: Relevant information about President Xi Jinping's visit with President Joko has already been released. We attach importance to developing friendly relations for cooperation with Indonesia, and would like to take President Joko's visit to China for the BRF as an opportunity to further consolidate pragmatic cooperation under the Belt and Road framework, further complement the development strategies of the two countries, and achieve more mutually beneficial and cooperative outcomes. China and Indonesia are friendly neighbors. We hope that our Indonesian friends in China can have a first-hand experience of the harmonious co-existence of different ethnic groups and religions as well as the amity of the Chinese people towards them. Q: What does China think of the current China-ASEAN relationship? And what does China expect to achieve from the 23rd China-ASEAN Senior Officials' Meeting? A: China sets great store by the China-ASEAN relationship. We always regard ASEAN as the priority of our neighborhood diplomacy. Thanks to the concerted efforts of China and the ASEAN member states, the China-ASEAN relationship is now growing with a sound and steady momentum. It has grown from a phase featuring rapid development to a stage where it keeps maturing, improving and upgrading. Last year, we celebrated the 25th anniversary of the establishment of dialogue relations between China and ASEAN. This year marks the 50th anniversary of the founding of ASEAN. And next year will see the celebration of the 15th anniversary of the strategic partnership between China and ASEAN. The China-ASEAN relationship is at a crucial stage where in face of new opportunities for development, we must build on the past achievements and usher in more. The China-ASEAN Senior Officials' Consultation is an important mechanism for senior officials in charge of ASEAN affairs from China and ten ASEAN countries to consult with each other annually. This meeting will focus on the China-ASEAN development and regional cooperation in East Asia and prepare for such high-level meetings within this year as China-ASEAN Leaders' Meeting and Foreign Ministers' Meeting. 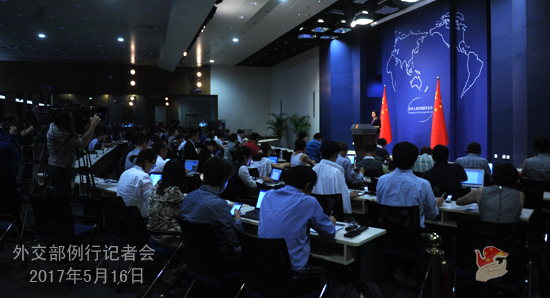 China hopes that this round of Senior Officials' Consultation will further align development strategies of China and ASEAN, promote practical cooperation, forge people-to-people and cultural exchanges into a new pillar, discuss a more advanced version of China-ASEAN strategic partnership, and knit an even closer community of shared future for China and ASEAN. Q: China and Vietnam sign a joint communique yesterday in which Vietnam reaffirms its commitment to the One China policy, its support to the peaceful development of cross-Straits relations and China's unification cause, and its firm opposition to any separatist activities for Taiwan independence. It also vows no official relations with Taiwan. Considering that Vietnam is one of the key countries covered by Taiwan's New South Policy, there is analysis saying that this Joint Communique is one of China's incremental steps to contain Taiwan's New South Policy. What is your response? A: President Xi Jinping met with Vietnamese President Tran Dai Quang on May 11. The joint communique was issued yesterday. As for the Taiwan-related contents in the joint communique, I want to say that it is our consistent position to uphold the One China policy and oppose Taiwan independence when dealing with Taiwan's external exchanges. We consistently and firmly oppose any country with diplomatic ties with us developing official relations with Taiwan. We fully acknowledge and commend Vietnam for reaffirming its strong commitment to the One China policy. Follow-up: are these relevant contents in the joint communique related to Taiwan's New South Policy? How will the New South Policy be affected? A: I repeat that it is our consistent position to uphold the One China policy and oppose Taiwan independence when dealing with Taiwan's external exchanges. We fully acknowledge and commend Vietnam for reaffirming its strong commitment to the One China policy. As for Taiwan's New South Policy, the Spokesperson for the Taiwan Affairs Office of the State Council has responded to that multiple time. Actions that contravene the laws of economic development for political purposes only will end up hurting Taiwan's economy and the interests of Taiwan business people. Q: What is the purpose of holding the 1st meeting of China-Philippines bilateral consultation mechanism on the South China Sea issue? What does China hope to achieve from it? A: The meeting aims to establish an institutional platform for dialogues on the South China Sea-related issues in accordance with the spirit of the important consensus reached between Chinese and Philippine leaders last October. China hopes and believes that the two countries will build up consensus, enhance mutual trust, disperse suspicion, properly manage disputes, and move forward maritime practical cooperation through bilateral dialogues so as to make the conditions more favorable towards the final settlement of the relevant dispute and create a good atmosphere for the sound and steady development of bilateral ties and the smooth progress of practical cooperation in various fields. We look forward to working with the Philippine side to ensure the success of this meeting. Q: This morning, President Xi Jinping met with Japan's LDP general president Nikai Junhiro, exchanging views on the bilateral relationship. What is your comment? A: We have released relevant information regarding President Xi Jinping's meeting with Japan's LDP general president Nikai Junhiro who is in China for the BRF. You can check on that. Q: First, yesterday, there were reports about US President Trump sharing intelligence with Russia. What is your view on the US President leaking intelligence to another country? Second, about the ransomware hacking, has the Chinese government been affected? What measures will be taken? Is China planning to cooperate with other countries to deal with this? A: On your first question, I have noted relevant reports. It is essentially the US's domestic affairs. I have no comment. On your second question, the ransomware hacking that has erupted in many countries around the world highlights the importance and urgency of the cyber security issue. China is also a victim of the hacking this time. China firmly opposes and cracks downs on all forms of cyber-attacks, advocates cooperation and dialogue to jointly address the threat to cyber security on the basis of mutual respect, equality and mutual benefit. We realize that this hacking has affected such an extensive area and a wide range of countries, which also speaks to the complexity of dealing with the cyber security issue. All parties should strengthen the concept for common security, safeguard peace of the cyber space, prevent cyber arms race, and ensure that cyber technologies are used for mankind's well-being. Follow-up: is China planning to cooperate with other countries to deal with this? A: On the issue of cyber security, China always stresses the importance of strengthening international cooperation. We have smooth communication and regular consultation with other countries on the issue of cyber security. China's position is quite clear. We advocate greater international cooperation for the effective maintenance of peace and security of the cyber space. So far I have no information on whether China has cooperated with other countries over the ransomware hacking incident. Q: First, what is China's response to reports alleging the DPRK's involvement in the ransomware hacking worldwide? Do you have any statistics about how many computers and corporations have been affected? Second, the UN Security Council warned of significant new measures if the DPRK continues with its missile launch in its press statement. Does China support this latest statement? Will China agree to impose sanctions if it is voted on? A: Regarding your first question, I have no information on that. Regarding your second question, as a result of the collective efforts by the Security Council member states including China, the UN Security Council has already issued a presidential press statement, unanimously opposing the DPRK's launching activities in violation of the Security Council resolution and reaffirming its position on peacefully resolving the issue. Under the current circumstances, all relevant parties should exercise restraint and refrain from further escalating tensions. China will continue with its comprehensive and faithful implementation of the relevant Security Council resolution and its efforts to cool down the situation and peacefully resolve the Peninsula nuclear issue through dialogue and consultation. Q: This weekend, countries will meet for the APEC Ministerial Meeting in Vietnam. The eleven countries still involved in the TPP are expected to discuss moving ahead with agreement without the US. Does China have a position on whether this is a good idea or not? Given the limited resources for negotiating trade deals in the region, does China think the priority should be the TPP or RCEP at this point? A: We have responded to such questions many times. China is open to regional trade arrangements that are conducive to the Asia Pacific economic integration. The economies in the Asia-Pacific region, with their different development stages and levels and great diversity, shall move forward the FTAAP following the spirit of mutual trust, inclusiveness, cooperation and win-win results. Q: There have been some reports saying that the DPRK is behind the cyber attack. Does the Chinese government have any clue of the origin of the attack? 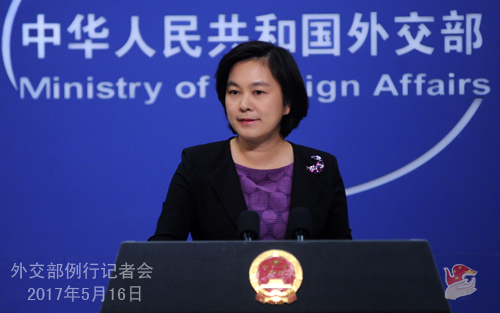 Q: We have noted China's response to the statement made by the India's Ministry of External Affairs. Still, India did not attend the BRF. Will there be any initiative from China to engage India on this after the BRF? A: The Belt and Road Initiative is open and inclusive, and the building of the Belt and Road follows the principle of joint consultation, extensive participation and shared benefits. During the BRF, we keep stressing on every possible occasion that the Belt and Road will be built by all and its dividends will be shared by all. What is important is how the India side chooses to view the Belt and Road Initiative. You've all witnessed the participation of more than 130 countries in the BRF. All attendees spoke highly of the role played by the Belt and Road Initiative in promoting regional cooperation, moving the economic globalization towards a more universally beneficial, balanced and inclusive direction, and boosting the realization of the 2030 SDGs. We would like to work with the international community to move forward this common cause. During the whole time, our door is always open. We welcome India if it wishes to enter the door. Q: One of the points made the India's Ministry of External Affairs is that it has been urging China to engage in meaningful dialogues about the Belt and Road Initiative, and it is waiting for positive response from the Chinese side. What is your reaction? Is China willing to have meaningful dialogues in terms of addressing India's specific concerns about it? A: In the past four years, the Belt and Road Initiative has been following the principle of joint consultation, extensive participation and shared benefits. China's purpose is crystal-clear and on the table for all to see. The warm response the international community has been giving to China's hosting of the BRF also speaks to that. 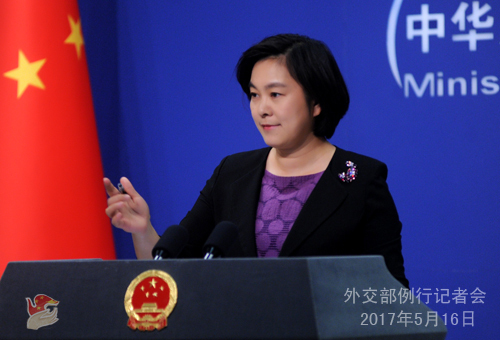 India's Foreign Ministry Spokesperson said that India wants meaningful dialogues and is waiting for positive response from the Chinese side. I don't quite get it. China's position is upright and clear. China's attitude is honest and sincere. We welcome India's participation in the Belt and Road Initiative.